Kirsten Gillibrand, a senator and now-Democratic presidential primary candidate who risked losing the support of big donors and some centrist Democrats by calling for Al Franken’s resignation, will continue to call out Congress for their failure to adequately address sexual assault in the workplace, on college campuses, in the military—and in Congress. She reiterated her support for victims of sexual misconduct at a CNN Town Hall on Tuesday night, and pledged to continue to fight for legislation to combat assault and harassment. Gillibrand mentioned a series of “easy reforms” she would pass if elected president, including instating a nationwide survey “so anyone who has suffered sexual violence can speak out and tell their story,” and making sure college campuses were staffed with sexual assault counselors who could help walk victims through the reporting process. “We already have bipartisan support. It’s the kind of thing we can come together and get done,” she said. Gillibrand has been one of the more outspoken candidates about sexual violence and the Me Too movement—in addition to being the first Democrat to call for Franken’s resignation, she spearheaded the Congressional Harassment Reform Act, a bipartisan piece of legislation that aimed to reform how Congress handles sexual assault. Still, her efforts to position herself as the Me Too candidate have not been without controversy. Last month, one of the Senator’s former staffers accused Gillibrand’s office of mishandling a sexual harassment claim filed last year against aide Abbas Malik. 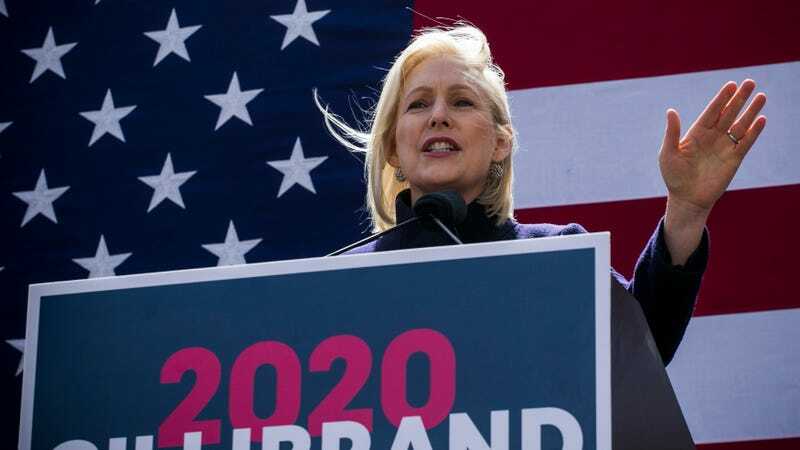 The staffer, who claimed Malik made repreated unwanted sexual advances toward her, quit in 2018 after Gillibrand and her staff allegedly ignored her report. Malik was dismissed just last month. Gillibrand has defended her office’s handling of the complaint.